Dubai, UAE, July 15, 2018: For the love of cycling Whether commuting through a busy town, riding idly through beautiful vistas or competing in a race, cycling is a truly popular sport. 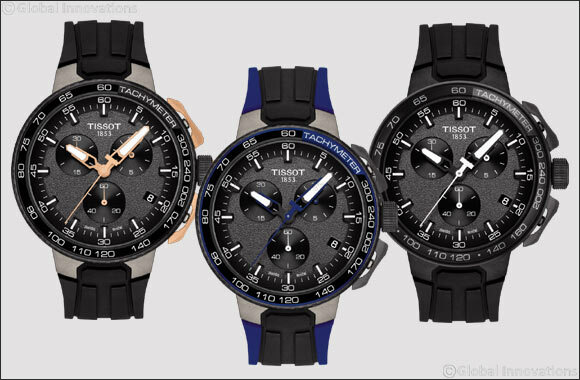 Tissot is delighted to celebrate the much-loved activity with the Tissot T-Race Cycling collection, which celebrates the sport of endurance and speed. Enthusiasts to professionals, and everyone in between, will love these watches that incorporate bicycle-inspired touches in a smart and stylish tribute. A model for every ride The Tissot T-Race Cycling reflects a bike itself in its sleek ergonomic design. Inspired by bicycle features, every part of the watch is a tribute, from the fork in the frame, reflected in the bracelet and lugs, the outside of the dial and the tachymeter bezel that represent the wheel, set on a carbon ring, all the way to brake levers integrated in the pushers and the cassette on the caseback and on the crown. The back of the bracelet even reminds us of the chain. If you're on the go, the time is quick and easy to read thanks to large hands and a clear, legible face. The family of watches is available in a variety of different colours, so everyone can easily find something to love. On the racetrack or at home, this is a watch that will always look good.